About the State and Local Tax "Buzz"
Interested in Our Tax Consulting Services? Federal Legislation With State Taxation Impact: On April 29th the U.S. House Judiciary Committee will hold a hearing to discuss a federal solution to the lack of uniformity that exists among states as it relates to an employer's responsibility to withhold state income tax from the wages of its mobile workforce in non-resident states. One reason this federal legislation is being seriously considered stems from the fact that many companies are expanding their multi-state (and international) footprint. This expansion is often accompanied with the deployment of a mobile workforce, and a requirement to withhold and remit state income tax on the wages of employees who perform services in non-resident states. As states continue to search for revenue sources and, some would argue, transfer their tax burden to out-of-state business and individual taxpayers; non-resident payroll withholding is an area that employers who wish to be compliant cannot ignore. Unfortunately, as is the case with state laws in general, there is a lack of uniformity regarding when an employer must withhold in non-resident states. While some states provide for either a day or dollar ‘di-minimus’ threshold, the majority of states require employers to withhold from the very first day or dollar earned in the state. This lack of uniformity requires employers that deploy a mobile workforce to comprehend and apply a patchwork of state rules. Additionally, while both in-house corporate tax professionals charged with state tax responsibilities and external State and Local Tax (SALT) advisors are quick to note that deploying a mobile workforce into multiple states may create nexus for corporate income, franchise, sales & use and other entity level business taxes, many tax professionals are less likely to focus on a company’s responsibility to withhold on the wages of employees who perform employment duties in non-resident states even though this lack of compliance presents the same potential for exposure and penalties. What Are the Issues with Nonresident Payroll Withholding and What Will the Federal Mobile Workforce Legislation Do? Recently I authored an article that was published in the March 2014 issue of the Institute for Professionals in Taxation (IPT) Tax Report. The article, aptly entitled "State Nonresident Payroll Withholding Rules Present Complexity to Employers that Deploy a Mobile Workforce - Is It Time for a Federal Mandate?" provides an overview of the non-resident payroll withholding rules and highlights how the lack of uniformity creates complexity for employers that wish to be compliant. Some of the specific topics I cover in the article include a discussion of the various thresholds employed by states currently (e.g., days exceeded, dollars earned) and how the rules within some states are inconsistent with the regards to the requirement to withhold on and the requirement to report non-resident wages, as well on an employee’s requirement to file a non-resident tax return. For instance, in some states even if an employee’s wages have not exceeded the threshold to withhold, the employer may still have a requirement to report the non-resident’s wages to the state. Similarly, a failure to withhold (because a threshold has not been exceeded) does not necessarily mean a employee is not subject to the same state's non-resident income tax filing requirements. The article also discusses the Mobile Workforce State Income Tax Simplification Act of 2013 (H.R. 1129 / S. 1645), the federal proposal whose merits the House Judiciary Committee will debate on April 29th. (Note, the Judiciary Committee’s April 29th hearing will focus on the House version of the “Mobile Workforce” legislation - H.R. 1129. A companion bill was also introduced in the Senate on November 5, 2013, S. 1645, which is also titled the Mobile Workforce State Income Tax Simplification Act of 2013.) Thus, I also provide an overview of the provisions of H.R. 1129 in the article and discuss how the proposal, if enacted, would limit a State’s authority by imposing a uniform “days exceeded” threshold before a State could subject a non-resident employee to the state’s personal income tax and his employer to the State’s non-resident withholding and reporting requirements. Will Mobile Workforce SIT Simplification legislation be enacted by the end of 2014? 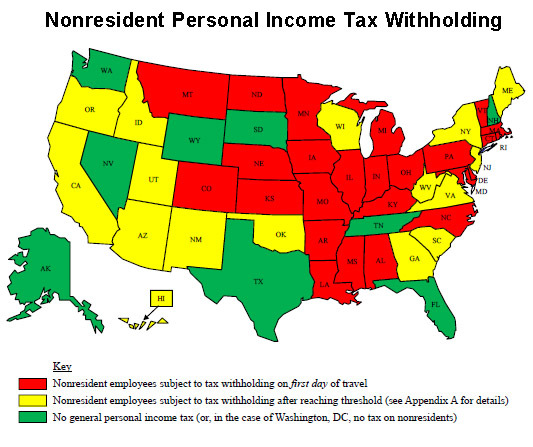 The Mobile Workforce State Income Tax Simplification Act of 2013 (H.R. 1129/S. 1645) has received the strong backing of numerous prestigious professional organizations, including the American Institute of Certified Public Accountants (AICPA), the Council on State Taxation (COST) and the American Payroll Association (APA) - organizations which have relentlessly supported prior similar proposals. However, the 113th Congress has been presented with several federal proposals which also focus, to some degree, on limiting or expanding State authority, such as the Marketplace Fairness Act of 2013 (S. 743/H.R. 684), the Business Activity Tax Simplification Act (H.R. 2992), the Digital Goods & Services Act (S. 1364) and the Permanent Internet Tax Freedom Act of 2013 (H.R. 434/S. 31). With only a little more than eight months remaining in the current Congressional session, it will be interesting to see where Congress turns its efforts. Missed my last post? Catch it here: The Massachusetts Tech-Tax Fiasco - Good Policy, Bad Policy or No Policy Connection? Thanks for your comment!! Relevant comments are sincerely appreciated! However, that comments which are suspected spam, including comments which seek to sell a product or have no purpose other than to drive traffic to an unrelated site will be flagged as spam and deleted. Do International Sellers Registering for Sales Tax Need a U.S. EIN?